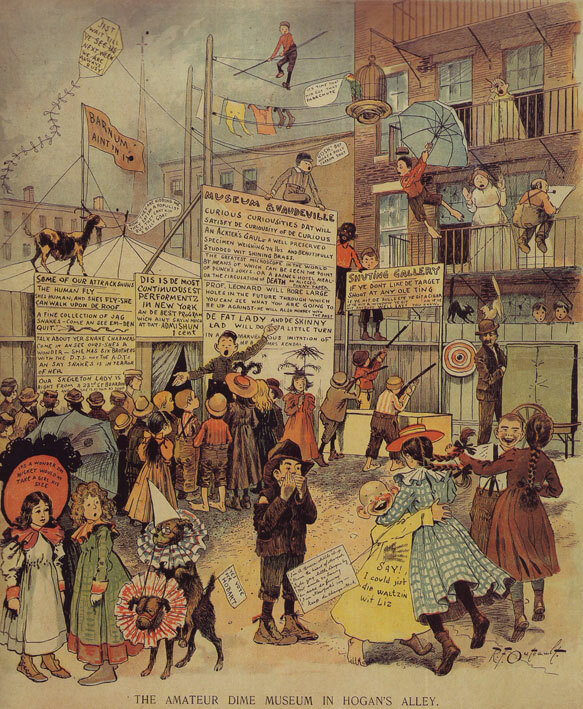 Richard F. Outcault’s The Kid first appeared in the press in 1894 in Truth Magazine. At that time the strip was in black and white, and following this, the character appeared in various other newspapers dressed in blue, and red and black polka dots, until finally settling in a yellow nightshirt by 1896. The bald-headed street urchin created by Richard F. Outcault is often – and controversially – credited as the poster boy for what we now understand universally as the modern day comic. I’m interested in the way that he is utilised as an almost human-formed speech bubble: Outcault emblazons the Kid’s spoken words on his clothing. The Kid ‘speaks’ via his yellow nightshirt.